9kg - Stoves, hobs, braais, portable heaters. 19kg - Stoves, hobs, and braais, heaters, small fireplaces. 48kg - Fireplaces, gas water heaters, commercial and industrial applications. 90kg - Now available! 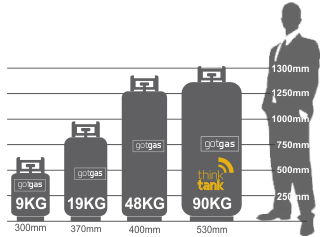 gas water heating, commercial and industrial applications.